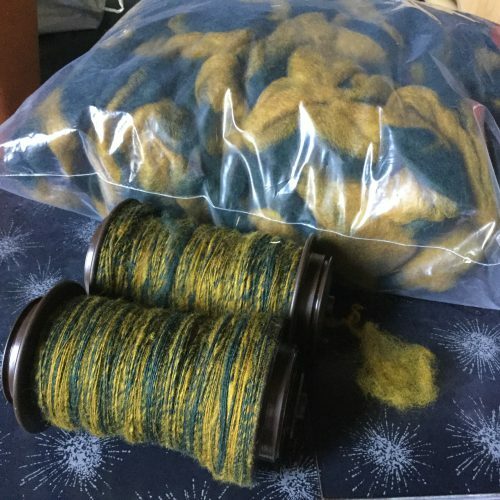 My Tour de Fleece goals this year were modest: 1) a fractal spinning project; 2) complete an unfinished spinning project. Given the volume I still have left of my chosen YIP, I’m not overly optimistic about my chances, but I’m still going to give it a shot. I’m visiting my folks, so without any competing projects from home, I have more spinning time than usual. 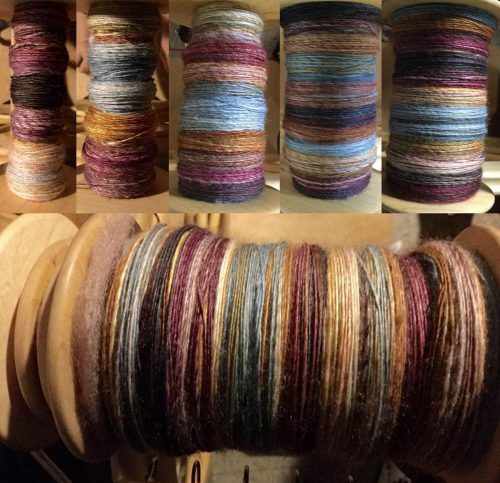 I’ve culled so much of my fiber stash that I had a rough time selecting a good candidate for a fractal spin, since most of my remaining fiber is either natural colored fiber, farm roving, or Hello Yarn dyed in random rather than repeating progressions. Since I didn’t have an ideal candidate, I picked something I though would make a good shawl (my planned project), a BFL/silk blend. Hello Yarn for Yarn School, “Kindled” colorway. 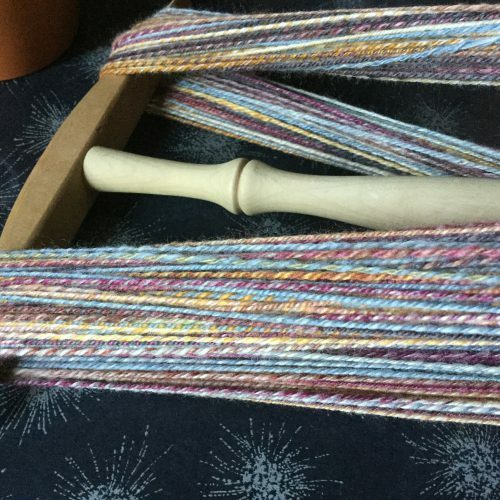 Halved lengthwise, one half spun continuously, then continue to halve each remaining strip lengthwise and repeat. I think I got a total of 4 splits. You can see how the progressions get shorter across the bobbin with each split. 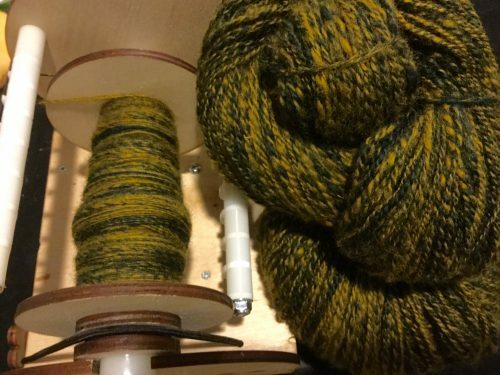 Spun on a Scacht Matchless to Jessica Jones and Sarah & Duck. Finally, chain-plied to preserve the scale/repeats–except I don’t think the colorway was inheriently suited to this projects, too many colors spaced too closely to really spell out the intention really clearly. 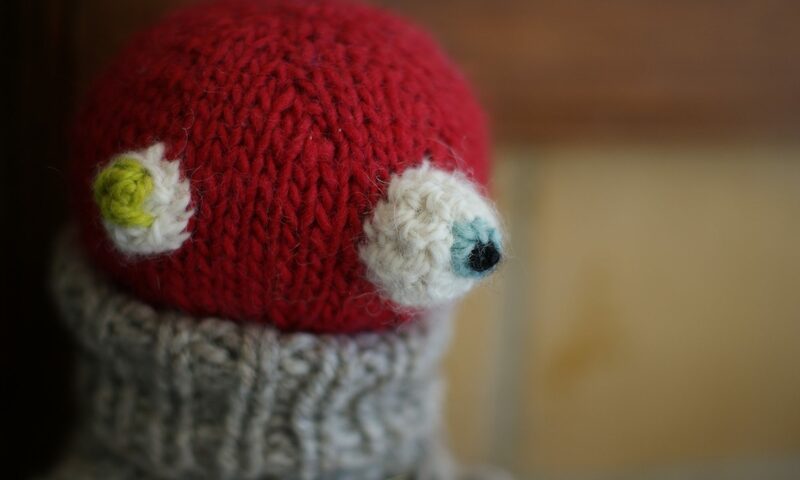 I won’t know for sure till I knit it. 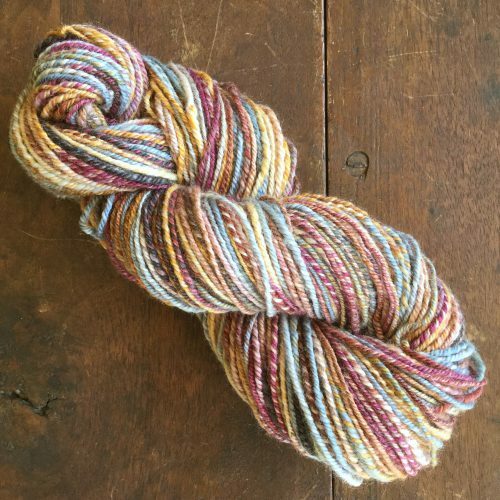 Either way, it’s soft and beautiful, and a pleasant, gentle colorway. Next project, still underway, is to add to the half bobbin spun at the last Spinsters meeting I attended last winter. 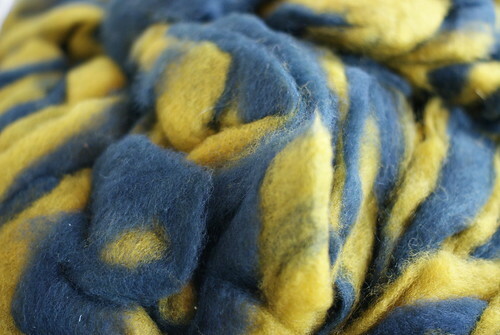 Started as Littlefarm bicolor roving purchased at Missouri Fiber Retreat in 2011. I think it was BFL, or maybe Finn? It’s always harder to guess roving that top if you can’t remember, since there’s so much variation within a breed & small farm runs can be more indicative of individual animals than the breed standard. Lazy, sloppy spin in a 2-ply. It’s been all over the place depending on my mood, sometimes careful shortdraw, sometimes fuzzy long draw. I figure it’s going to be a rough, fuzzy, irregular sweater. Spun to lots of Last Week Tonight, a bit of Stranger Things, and Cosmos. I brought my Electric Eel with me to MD Anderson this time for my dad’s chemo & realized if I’d been doing that all of the last year instead of joylessly dicking around on my ipad, I’d have a lot more yarn & sweaters right now. I’m going to leave the Eel in Houston so I can spin whenever the relentless Fox News barrage makes me want to self-deport. (Though today, Dad’s letting T binge on cartoons, so I’ve gotten a refreshing break from the “fair” and “balanced” news (that’s where they put the quotes, right?). In bright news, dad’s current chemo is making good progress against his cancer, after many months of mixed results, progression, and autoimmune & diabetic complications. It was great getting good news that wasn’t immediately tempered with bad news! If only he would quit smoking, I could start to relax again. Anyhoo, back to spinning!